In 2016, rates of marijuana use among the nation’s 12- to 17-year-olds dropped to their lowest level in more than two decades, according to federal survey data released this week. Last year, 6.5 percent of adolescents used marijuana on a monthly basis, according to the latest National Survey on Drug Use and Health. That represents a statistically significant drop from 2014, when the nation’s first recreational marijuana shops opened in Washington state and Colorado. The last time monthly teen marijuana use was this low was 1994, according to the survey. Public health experts tend to worry more about adolescent than adult drug use because adolescent brains are still developing. Teen drug use is linked to a host of health problems later in life, including addiction, criminal behavior and cognitive deficits. 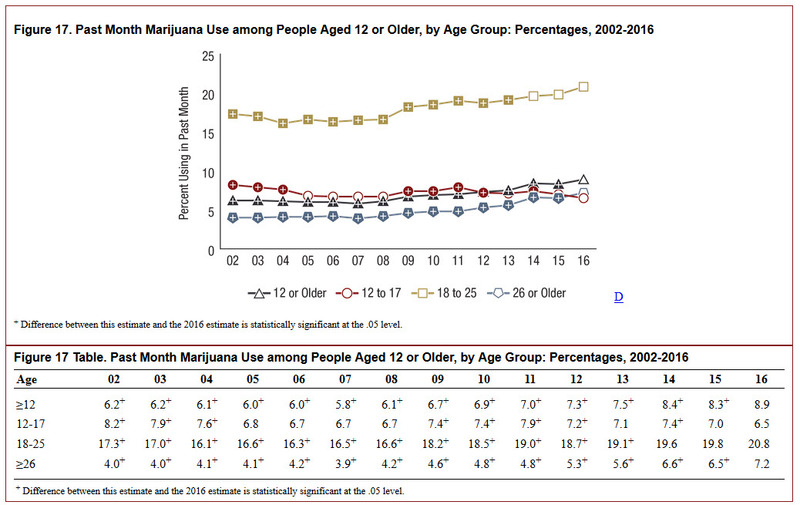 The federal data show that adult marijuana use, on the other hand, is rising. Last year 20.8 percent of Americans between the ages of 18 and 25 used marijuana at least monthly, the highest number since 1985. Among adults ages 26 to 34, 14.5 percent used marijuana monthly in 2016, also the most since 1985. Those numbers have been rising for several decades, well before the advent of legal recreational and medical marijuana. The survey didn’t provide trend data for older age groups, but other studies have shown that marijuana use is growing the fastest among middle-aged and older adults. While marijuana use increased among adults, past-month alcohol use fell, according to the survey. Last year 55 percent of adults ages 18 and older drank alcohol at least monthly, compared with 56 percent in 2015. While small, that drop was statistically significant, lending some credence to the notion that some adults may be substituting marijuana for alcohol. Public health research has generally shown that alcohol use is more harmful to individuals and society than marijuana use, although marijuana still poses a number of risks to its users. Nationwide, over 60 percent of American adults say marijuana use should be legal, according to an August 2017 Quinnipiac poll.